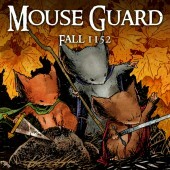 In Mouse Guard, mice struggle to live safely and prosper among all of the world's harsh conditions and predators. Thus the Mouse Guard was formed. They are not simply soldiers that fight off intruders; rather, they are guides for commonmice looking to journey without confrontation from one hidden mouse village to another. The Guard patrol borders, find safeways and paths through dangerous territories and treacherous terrain, watch weather patterns, and keep the mouse territories free of predatory infestation. They do so with fearless dedication so that they might not just exist, but truly live.